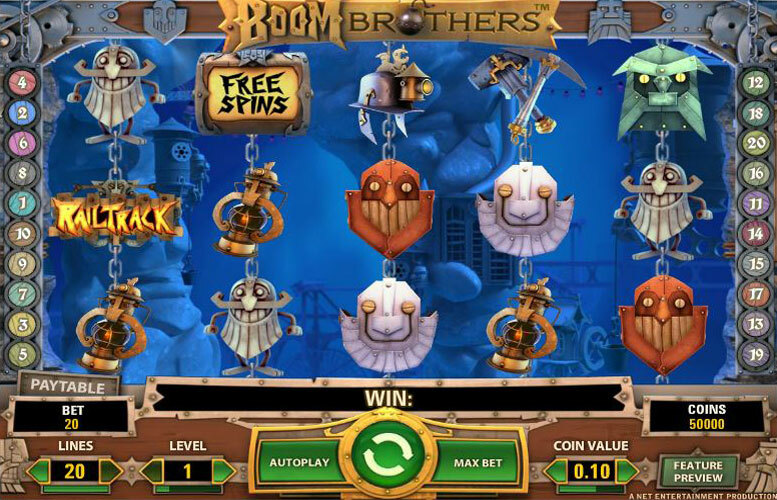 Boom Brothers offers the chance to win up to 112,500 coins in any one spin. You can also trigger free spins and a bonus feature where you’ll have to guide the dwarves across the rail track. Get them to the other side and you’ll be rewarded handsomely for your efforts! It is obvious that the creators of this game (NetEnt) put in a lot of time and effort, which is immediately evidenced by the cut scene as soon as the game loads. As players will learn, this 5 reel, 20 payline slots machine takes place in a diamond mine with some helpful pyromaniac mining dwarves to aid them in the quest to win money. The graphics on this slot are astounding and of a caliber not typically seen in slot games. The game has many features, including a wild, scatter, a bonus mini game, and even a second chance win feature that can be randomly triggered from not obtaining any combinations. The background sounds included a simple music track and players can also hear dripping water, which helps lend to the feel that they are in a deep underground mine. The game has a good maximum payout and there are many other ways to win good sized payouts as well making this a top slot to try. The highest payout in the game from comes from spinning five wilds on any active payline and awards 7,500 credits. However you can win up to 112,500 during free spin rounds, where winnings are multiplied by 3 and during which you can trigger extra free spins as well. This is high in comparison to most games and what makes it even better is there are many other ways to win good sized payouts. Other ways to win big are the free spins, which will triple all regular payouts. The nice thing about this game is that during the free spins, any free spin symbols will award another free spin and although the winnings will not be tripled, the bonus game can be activated during free spins. The bonus game is another way to make big money and involves players engaging in a game where three dwarves race across cart tracks and the first to the finish pays the associated reward, which will be somewhere between 50 and 1900 credits depending on who wins the race and how much they decide to pay. Finally the Railtrack Feature offers additional multipliers of x2, x3 or x4 (plus bonus game activation) with the correct combinations. 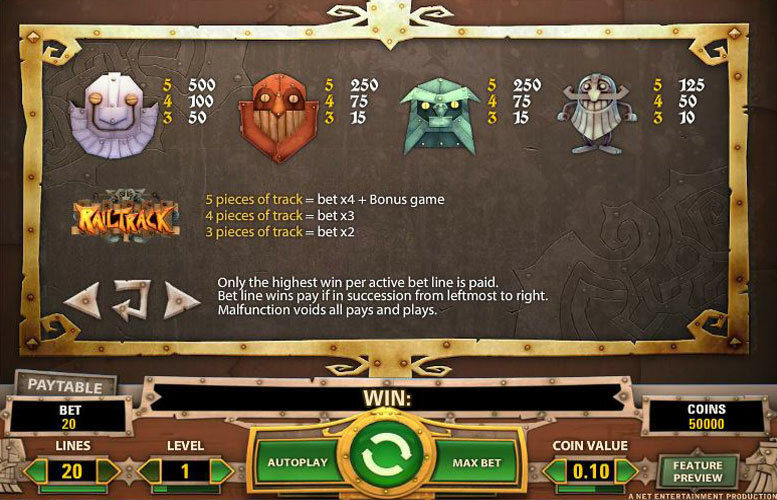 This game features the ability to choose the number of paylines, a betting level, and a coin value. Coin values begin at 0.01 and go up to 1.00 credits. There is a maximum of 20 paylines to bet on. The betting level goes from 1 to 5. As with most games, the maximum bet of 1 credit at bet level 5 on all 30 paylines in necessary to win the biggest prizes. One nice feature about this game is the second chance win feature. It will occur randomly and only on the spins where no winning combinations are made. A dwarf in a cart will appear and drop barrels of TNT on one or more reels, which will explode and cause them to spin again in an attempt to help the player win. Wild – The wild is depicted as a bomb and will explode when it is part of a winning combination. It will also pay out for getting combinations of two or more. Two pays out a measly five credits. Three will award 200 credits. Players can win 2000 credits for four and the highest payout of the game is 7,500 credits for spinning five wild. Free Spins – This is a simple sign with ‘free spins’ written on it. They work as a scatter, so players can activate the free spin bonus with three or more anywhere on the reels. When a player spins at least three, the symbols will spin around and each will reveal a various number between 8 and 50. 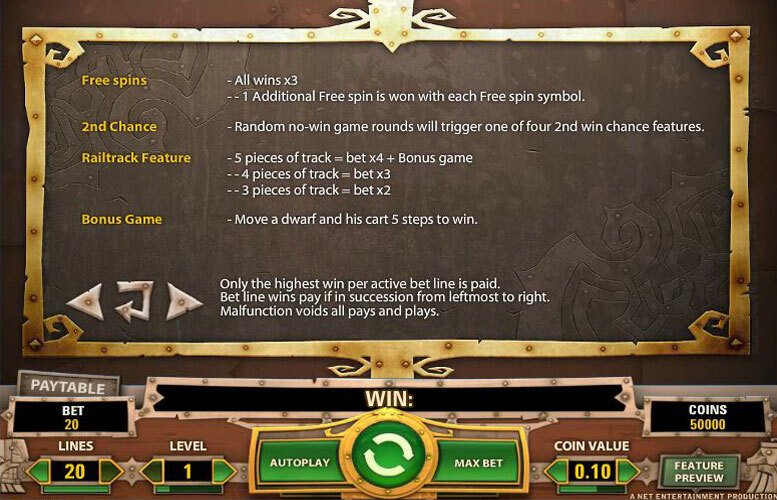 The values are added together and that is the number of free spins the player is awarded. Regular payouts are tripled during free spins, and for each free spin icon collected during those spins another spin is added. 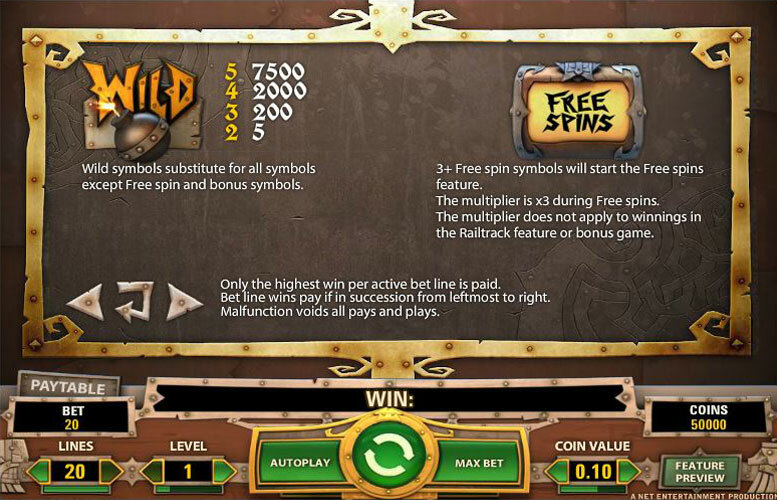 The free spin symbol will only appear on the third, fourth and fifth reels during the free spins feature. Railtrack – This is the bonus symbol of Boom Brothers and is a rather simple with the word ‘Railtrack’ emblazoned on it. Initially, it will only show up on the first three reels and must be on an active payline in order to begin the bonus feature. The fourth and fifth reels are spun again in order to allow players to try to activate the mini game. If a player gets five in a row, they go to the mini game. If they miss the bonus symbol on the last two reels, players are rewarded with double their bet. If they get the fourth in place, they will be rewarded with triple their bet. Five will quadruple their bet and activate the game. In the game, players select one of three carts at a time to move dwarves in carts across the tracks and to the finish in order to win a bonus that falls between 50 and 1900 coins. Bucket and Lantern: These pay the lowest values and are equal to one another. Three will pay out five credits. Fifteen credits will be paid for four and five will award 75 credits. Pickaxe – Getting three of these mining icons gives the same five credits, four rewards 25 credits and having five in a row on an active payline will give out 100 credits. Drill – Combinations of three or five drills will pay the same as the pickaxe. Four pays 50 credits, rather than 25 credits like the pickaxe. The next four symbols all feature different types of colors of masks. Should a player get them in any combination on a payline, they have special animations that accompany them. Gray Mask- This is the first of the masks. It will pay out 125 credits for five. Four awards 50 credits and three will pay out 10 credits. Green and Red Masks- The next two masks have the same values. They will award 15 credits for three on an active payline. Four results in an award of 75 credits. Five of either of these will pay out 250 credits. Silver Mask- the final mask pays the most of the regular combinations with a reward of 500 credits for five. Four or three will pays 100 or 50 credits respectively. This game has a rating of 3 / 5 with 198 total reviews by the users.